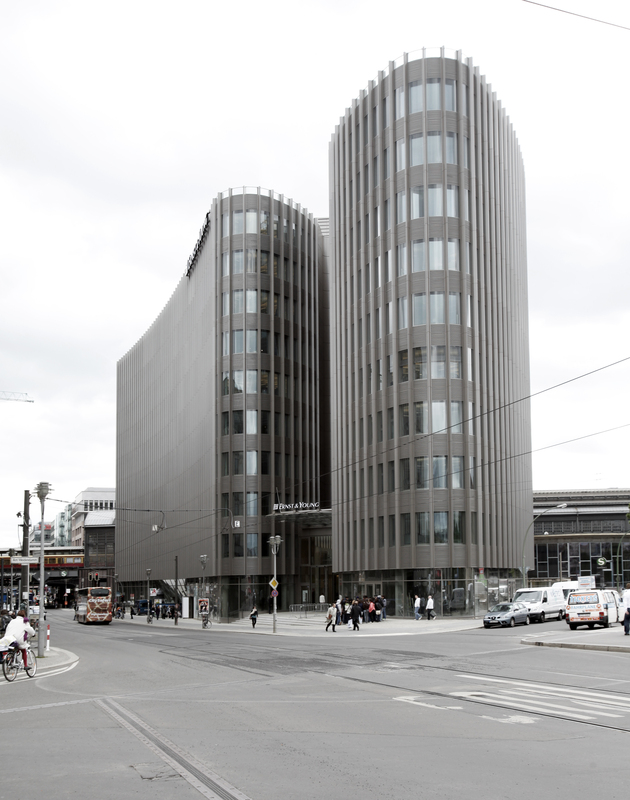 Berlin, 11 August 2010 – The management board of Ernst & Young, one of the world’s leading accounting and consultant firms, now meets on the top floor of their new branch in Berlin with stunning views of the German parliament – and an extravagant handcrafted conference table by KINZO (www.kinzo-berlin.de) to match: The young Berlin-based architecture and design office KINZO designed a table that echoes the curvy, slightly triangular room layout as well as the striking architecture of the building at Berlin’s famous Friedrichstraße. With its sweeping, dynamic and asymmetrical lines and bold structural design, this table seems to change its looks from every angle you look at it – clearly an inspiration to “think outside the box”! Depending on your perspective, it could remind you of a starship, a deep-sea ray or a hydrofoil. With its design, its smooth, silky surface feel and elaborated functional details this table nevertheless exudes the well-tempered dignity worthy of an executive suite – while avoiding the usual wood-and-leather stereotypes. By exactly following the room’s ground plan, the table makes the most out of the 48 sqm, but leaves consistently ample space all around to enjoy the panoramic views across Berlin. Four flush-mounted “media tanks” swallow unsightly cables and provide power and network access for laptops and other devices. KINZO designer Karim El-Ishmawi commented: “Apart from conventional meetings, telephone and videoconferences, meeting rooms today are often used as temporary workplaces – especially for visiting executive managers from around the world. 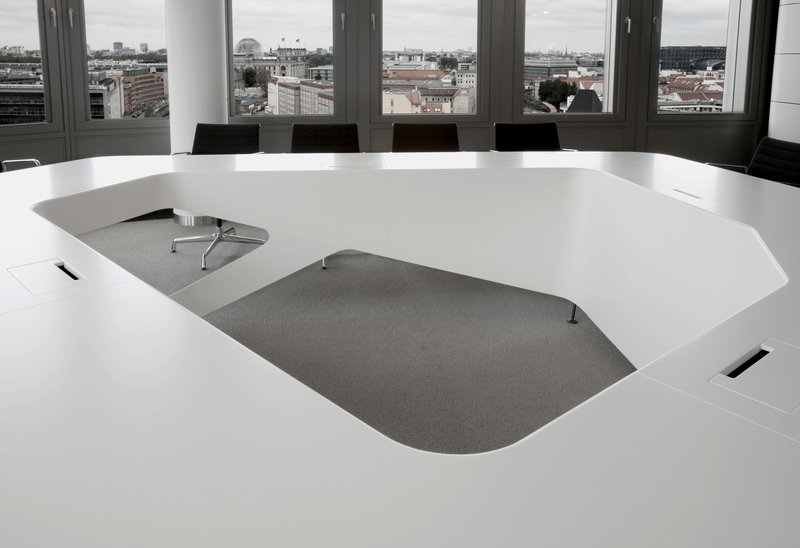 Therefore the conference table for Ernst & Young is designed to enable a comfortable and effortless connection for internal and external media and devices. 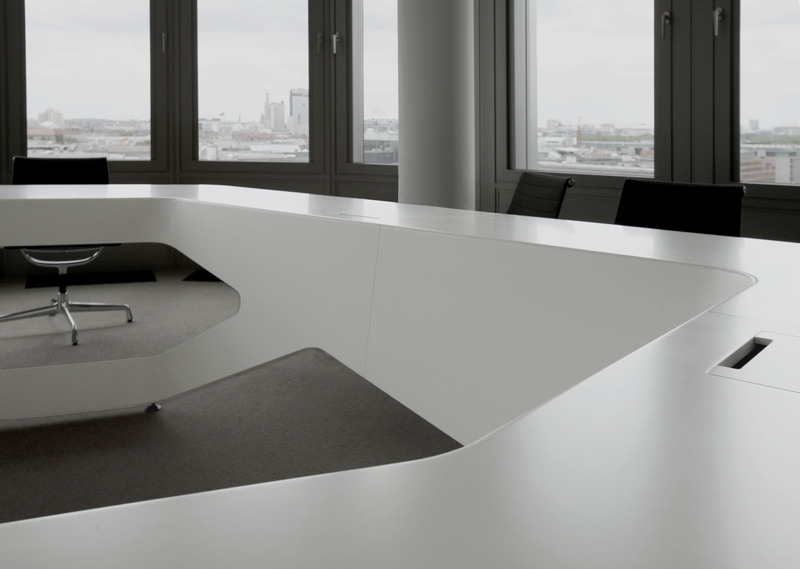 The table’s shape allows many different seating arrangements that enhance communication - for two-party meetings as well as for ”round table” discussions and presentations. The slightly sloped table edge underlines the sporty elegance of the design; at the same time it prevents blood stasis in the forearm. KINZO achieved ample legroom for 15 persons so no one will bump into the table legs – simply because there are no table legs. The handcrafted, beamless construction (length 412 cm, width 424 cm, height of 74 cm) consists of a combination of MDF and lightwood, which is reinforced by steel sections and painted in matte-white. KINZO has taken a principle from structural engineering by fixing the table’s structure on a circular beam: the inner ring supports the cantilevered table surfaces. The balance point is cleverly placed to echo both the spatial and structural context: the inner ring is completely closed at the table’s “head” – the chairman’s seating position thus virtually forming the table’s “centre of gravity”! (As a side effect, the table completely hides any view of the chairman’s legs and feet). 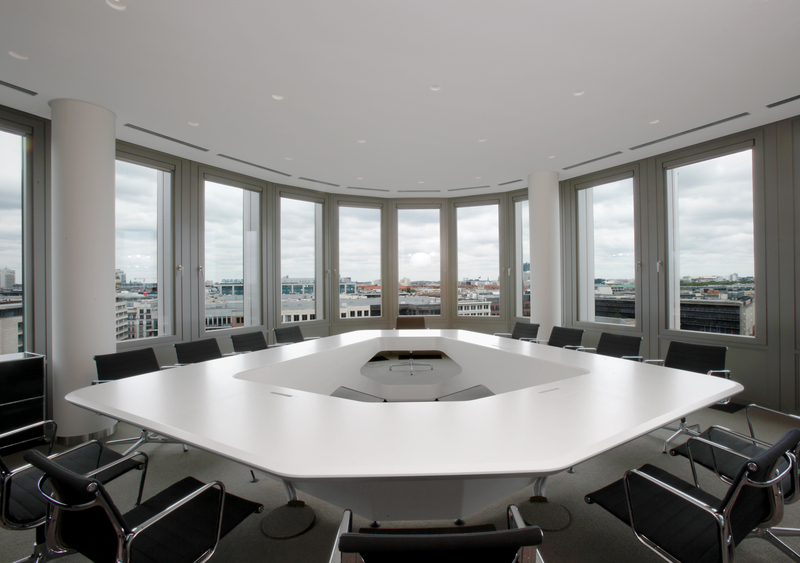 Starting from the “heavyweight” chairman’s position, the table looks increasingly lighter and airier in connection with the opposing panoramic windows – a playful take on statics, that creates a very dynamic vibe: In this way, the conference table reminds you of a rocket that is just about to take off – and break directly through the glass front. Karim El-Ishmawi explains: “A successful consulting firm such as Ernst & Young wants to foster a creative, dynamic spirit and unconventional thinking. We have designed this table as a completely abstract object, purposely avoiding any traditional scales, patterns and shapes, to allow interpretation and inspiration for the members of the board. From its pure form, this abstract object could be anything – you could see it as a sophisticated bottle opener, as a high-speed jetfoil, a white deep-sea ray or a freeze frame of a space glider flying by at the speed of light.“ Indeed the board table looks differently from every perspective – sometimes oblong, sometimes wide, sometimes floating lightly and sometimes statically grounded. This one-of-a-kind piece was realized within a tight budget framework: an off-the-peg conference furniture system by one of the well-known brands wouldn’t have come much cheaper. In short: With KINZO, exclusive individuality, style and optimised functionality do not exclude cost consciousness.